A Malaysian politician has been charged with sedition on Tuesday over a video posted on YouTube. Teresa Kok is a federal MP and vice-chairman of the Democratic Action Party (DAP), one of the parties that form the federal opposition coalition. She was charged under the Sedition Act, a colonial-era law that could mean a three-year jail sentence. The video in question is titled ‘Onederful Malaysia’ (at the bottom of this post) that was posted on YouTube as part of the Lunar New Year celebrations in Malaysia, and is described as a political satire that pokes fun at the government. Anyone who has seen my video will know that it is merely a political satire where the issues and jokes raised by the actor and actress are in jest and they were topics of discussion by ordinary people in the country. Prosecuting me over a simple political satire not only shows how hollow and insincere is the Prime Minister‘s promise to repeal the Sedition Act, it also shows how political darkness has now returned to this nation after the last general election. I will fight this heinous charge to the end. I have not committed any crime and I shall be proven innocent in court. Ms. Kok has received support from her colleagues and some netizens. What will Obama say of Najib if he is informed YB Teresa Kok will be charged for sedition over the video clip ? Granted the political satire may be a tad off colour, but the issues it poked fun at are valid concerns. I assumed (wrongly) that as a member of parliament Teresa would fight our battles in Parliament, not in front of a camera, posing as a TV chatshow host. That video was in bad taste, more so because it has given the BN (ruling party) ammunition to attack her along racial and religious lines. A very foolish political move on her part. She could have put her time to better use by calling for unity despite our country's many ills. That's the Teresa I thought I knew. She cannot play the victim now when she herself caused this silly and now, overblown fiasco to happen in the first place. In my view, she kinda blew it for women politicians. 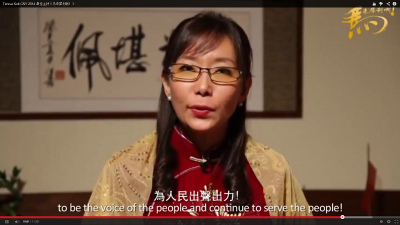 How could Teresa Kok as a Member of Parliament come up with such a video clip provoking the people with a mischievous hidden agenda? Does it look good to make fun and joke about the government’s policies and then you come up and say it’s satirical? Does it make sense, or does she think everyone is stupid?